Here’s a collection of courses designed to further your knowledge in user experience design. Happy learning! 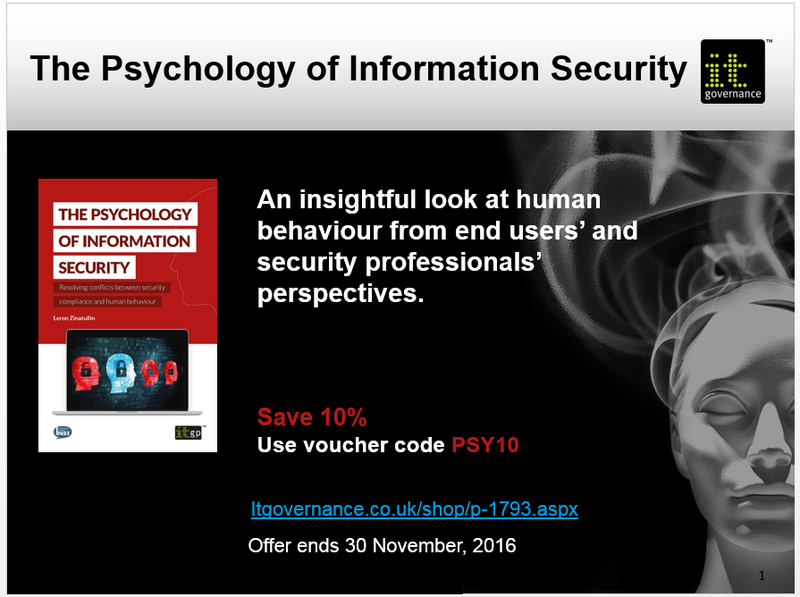 IT Governance Publishing kindly provided a 10% discount on my book. Simply use voucher code SPY10 on my publisher’s website. Offer ends 30 November 2016. I’ve been asked to share my views on creating a security culture at the workplace with The State of Security. I believe the goal is not to teach tricks, but to create a new culture which is accepted and understood by everyone. In order to effectively do so, messages need to be designed and delivered according to each type of employee: there is no such thing as a one-size-fits-all security campaign. Questions that must always be answered include: What are the benefits? What does it matter or why should I care? What impact do my actions have? Security campaigns must discard scare tactics such as threatening employees with sanctions for breaches. Campaigns should be oriented towards the users’ goals and values, as well as the values of the organisation, such as professionalism and delivery. A security campaign should emphasise that employees can cause serious damage to an organisation when they engage in non-compliant behaviour, even if it appears to be in an insignificant way. They should understand that they are bearing some responsibility for the security of the organisation and its exposure to risk. Furthermore, the entire organisation needs to perceive security as bringing value to the company, as opposed to being an obstacle preventing employees from doing their job. It is important for employees to understand that they contribute to the smooth and efficient operation of business processes when they follow recommended security practices, just as security enables the availability of resources that support these processes. In order to reduce security risks within an enterprise, security professionals have traditionally attempted to guide employees towards compliance through security training. However, recurring problems and employee behaviour in this arena indicate that these measures are insufficient and rather ineffective. Security training tends to focus on specific working practices and defined threat scenarios, leaving the understanding of security culture and its specific principles of behaviour untouched. A security culture should be regarded as a fundamental matter to address. If neglected, employees will not develop habitually secure behaviour or take the initiative to make better decisions when problems arise. The goal is not to teach tricks, but to create a new culture which is accepted and understood by everyone. Come join us at the Security Awareness Summit on 11 Nov for an amazing opportunity to learn from and share with each other. Activities include show-n-tell, 306 Lightening Talks, video wars, group case studies and numerous networking activities. Learn more and register now for the Summit.